Henley Morgan Bats for Asset Based Community Transformation — UTech, Ja. Dr. Henley Morgan, Management Consultant delivering the UTech, Jamaica 60th Anniversary Distinguished Public Lecture on Thursday, November 22, 2018 at LT-50, Shared Facilities Building, Papine Campus. Dr. Morgan, who has spearheaded multiple social enterprises which have empowered hundreds of young people living in the economically depressed inner city community of Trench Town, took the captive audience on a reflective journey, detailing how he has used his successful model of asset based community development to impact human capacity building and social and economic development at the community level and by extension, Jamaica. Dr. Morgan explained that the company uses the Triple Bottom Line concept incorporating spiritual (the church), financial (business) and social (NGO) assets. Surplus is used to achieve sustainability and for further investment in the community. The company which promotes self-reliance by tapping into the energy, talent, creativity and ingenuity of the people, has its own CEO, a chairman and various business divisions. 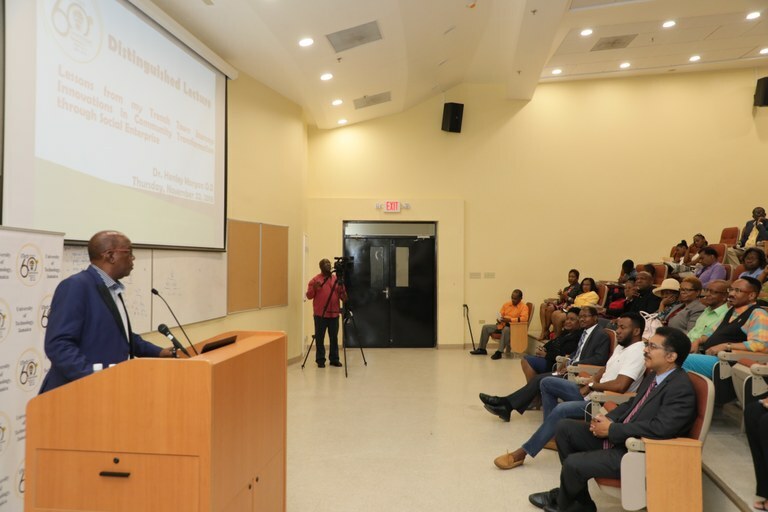 The company is a significant employer, supplying hundreds of contract workers to companies like Honey Bun Limited, Salada Foods Limited, Jamaica Flour Mills Limited and Lasco Group of Companies, among others. Morgan explained the approach of focusing more on Asset Based Community Development (ABCD) versus the traditional focus on needs analysis. Among the many assets of Trench Town, he identified, is the community’s pool of young, trainable population; a rich cultural and musical heritage; wide range of education institutions, churches and civil society institutions and an international brand in reggae, made famous by Bob Marley who was born in the community. Morgan also pointed to the community’s strategic location as a hub within industrial clusters of Kingston. Through video and photo presentations he shared on the many social enterprise projects being successfully operate under the AIR umbrella. These range from tour companies catering to tourists from all over the world to music studios and ice cream depots. Among the enterprises are the Jamaica Music Institute (JaMIN) Recording Studio & Protocols Certification Lab, JaMIN Tours & Destination Management and JaMIN Ice Cream and Frozen Novelties Depot. AIR has also founded, The Miracle Club – a coaching and mentoring organization for young persons, focusing on knowledge acquisition and experiential learning, managed by Dr. Morgan’s son, Adriel. The social entrepreneur further underscored the importance of having and sticking to a mission statement, setting and following priorities and having the right strategic plan and a high quality team. He also cautioned both organizations and individuals to resist trying to be “all things to all men,” and emphasized the value of public/private and civil society partnership. 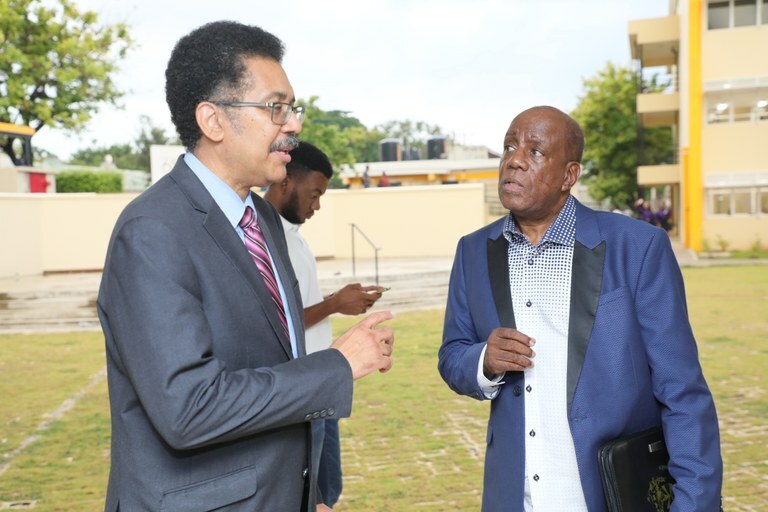 Ending with recommendations to UTech, Jamaica, Dr. Morgan challenged the university to establish a Caribbean Centre of Excellence for Community Transformation to help in the development of people who transform communities. The Lecture was chaired by Professor Stephen Vasciannie, CD, President, UTech, Jamaica. Professor Vasciannie noted that “like AIR, UTech, Jamaica is in the business of developing talent.” The President thanked Dr. Morgan for welcoming several groups of UTech, Ja students from the Joan Duncan School of Entrepreneurship Ethics and Leadership (JDSEEL) to his projects in Trench Town, as part of their study tour for the module in Social Enterprise. These students have been led by Dr. Horace Williams, Lecturer, JDSEEL and former Chairman, AIR and by Dr. Andrea Barrett, Lecturer, JDSEEL. The Vote of Thanks was ably moved by Dr. Rohan Lewis, Dean, Faculty of Education and Liberal Studies who thanked Dr. Morgan for his excellent lecture and personal style of sharing his Trench Town journey. Professor Stephen Vasciannie (left), President, in discussion with Dr. Henley Morgan ahead of the lecture. Pictured in the background is Adriel Morgan, son of Dr. Morgan.